Experience the ancient Mayan ruins and miles of lush tropical rain forest, along with premium comfort, attentive service and upscale amenities. Surrounded by beautiful gardens, the deluxe rooms are spacious and offer a terrace or balcony. Rooms include a king size bed or two double beds, air conditioning, ceiling fan, flat screen TV with satellite service, telephone, coffee maker, alarm clock, in-room mini-bar, safe-deposit box, iron and ironing board, hairdryer and bathroom with shower. Resort discounts cannot be exchanged for cash, neither totally or partially and no unused portion thereof will be refunded. The resort discount cannot be combined with any other discounts, offers or promotions (Additional restrictions may apply. Promotion may change without prior notice). Exceptionally spacious, the Junior Suite includes a king size bed or two double beds, air conditioning, ceiling fan, flat screen TV with satellite service, telephone, coffee maker, alarm clock, in-room mini-bar, safe-deposit box, iron and ironing board, hairdryer and bathroom with shower. Rooms also have a large living area with a sofa and a balcony or terrace, ideal for Guests to relax while enjoying the views of the resort`s tropical gardens, It includes a bottle of sparkling wine in the room, strawberries covered in chocolate and a continental breakfast in bed one (1) morning during the stay (Reservations must be made in advance with Concierge. Please note: These rooms are located on the corners of buildings; there are no connecting rooms in this category. Surrounded by beautiful gardens the deluxe rooms are spacious and offer a terrace or balcony. Rooms include a king size bed or two double beds, air conditioning, ceiling fan, flat screen TV with satellite service, telephone, coffee maker, alarm clock, in-room mini-bar, safe-deposit box, iron and ironing board, hairdryer and bathroom with shower. Generously sized, Royal Level Luxury offers personalized service and upgraded amenities. This room category has been designed for you to enjoy a premium service. The bedroom has a king size or double beds with a large balcony or terrace. Amenities: Private bathroom with shower and hot tub, air conditioning with individual control, ceiling fan, two flat screen TVs, DVD player, Telephone, Electronic safety deposit box, iron and ironing board, plush bathrobes and slippers, hairdryer, VIP bath amenities, mini-bar replenished daily with water, soda and beer, coffee machine, radio alarm clock. Comfortable and inviting, the Royal Level Suites feature a separate living room with small dining area, private bedroom with balcony. Rooms have a king size or two double size beds. Exclusive Amenities Include: VIP check-in and check-out, welcome fruit platter & bottle of wine, exclusive Royal Level a la carte restaurant and bar serving premium liquors and snacks, exclusive Royal Level Solarium Deck with Bali beds and beverage service, exclusive Royal Level pool, VIP bath amenities, plush bathrobes & slippers, nightly turndown service, free room service from 7:30 A.M. to 10:00 P.M., air conditioning with individual control, one flat screen TV, DVD player, mini-bar replenished daily with water, juice, soda, beer and snacks, coffee machine, electronic safety deposit box, radio alarm clock, Plush bathrobes & slippers and daytime assistance of Concierge for Spa appointments and tours and excursions. Resort discounts cannot be exchanged for cash, neither totally or partially and no unused portion thereof will be refunded. The resort discount cannot be combined with any other discounts, offers or promotions. (Additional restrictions may apply. Promotion may change without prior notice). PLUS receive $920 USD in Resort & Park Discounts! Resort discounts cannot be exchanged for cash, neither totally or partially and no unused portion thereof will be refunded. The resort discount cannot be combined with any other discounts, offers or promotions (Additional restrictions may apply. Promotion may change without prior notice). Promotion is valid until December 31, 2017. Located adjacent to world-famous eco-archeological Xcaret Park. The resort is only a few miles from the renowned town of Playa del Carmen, and about 50 miles (80 kilometers) south of Cancun International Airport. Experience the awe-inspiring sights of ancient native Mayan ruins and miles of lush tropical rain forest, along with premium comfort, attentive service, and upscale amenities. Those with a relaxing vacation in mind will find an oasis on the resort`s private secluded beach. Occidental at Xcaret Destination boasts 11 International restaurants and ten bars to fit every mood and occasion, from a romantic dinner to a boisterous family meal. Resort discounts cannot be exchanged for cash, neither totally or partially and no unused portion thereof will be refunded. The resort credit discount cannot be combined with any other discounts, offers or promotions (Additional restrictions may apply. Promotion may change without prior notice.) Promotion is valid until December 20, 2019. The hotel consists of 764 spacious and richly decorated rooms. All of the rooms and suites feature a telephone and data port connection, air conditioner, safety deposit box, satellite TV, hairdryer, iron and ironing board and a mini-bar that`s restocked every other day with water, sodas and beer. Handicap rooms are also available. When you are ready to indulge in an incredible dining experience, the 11 restaurants offer a wide array of choices to please any palate. Try their signature margaritas at one of the ten bars scattered throughout the resort serving international brands of liquor. Guests can enjoy four a-la-carte dinners per week of stay (reservations required). Please Note: All a-la-carte restaurants at the resort observe a dress code (men to wear long pants, no beachwear or sandals). Warm Sunshine Making You Thirsty? Quench your thirst at any of the 14 bars and lounges on the grounds of Occidental at Xcaret Destination. Two popular choices include the swim-up bar in the main pool and the sports bar, however all enjoy serving exotic tropical cocktails and your favorite beverages. If you are too exhausted from all the fun to go out, enjoy relaxing in your room, where VIP amenities include a stocked mini-bar with drinks and snacks (room service is available for Guests staying at the Royal Level). This is an exclusive plan for Occidental at Xcaret Destination Guests only (applicable only to specific room types), which grants unlimited access to Xcaret eco-archaeological park and the possibility to enjoy unique moments of fun, culture and tradition for the whole family. Without a doubt it`s the best way of experiencing the comfort of a luxury hotel, immersed in the atmosphere of respect for nature and passion for Mexico of this world-renowned park (unlimited Xcaret Xperience offers exclusive benefits for Guests of Occidental At Xcaret Destination). Occidental at Xcaret Destination is located adjacent to the eco-archeological natural wonder Xcaret Park. 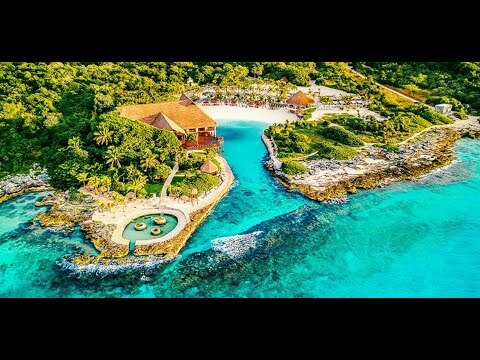 This magnificent resort features the Occidental Unlimited Xcaret Xperience*(UXX) package specially designed for its Guests. This packages offers unlimited access to the Xcaret park during the stay ($). Guests with reservations for the UXX package will enjoy over 40 exhibits and attractions at the world renowned eco-archaeological Xcaret Park. Enjoy unique moments of fun in the comfort of an all-inclusive resort while you immerse yourselves in the culture and traditions of Mexico. Free Honeymoon Package: Special check-in at Guest service desk, floral decoration in-room upon arrival, continental breakfast in bed (one day of stay, to be arranged with Guest services), special recognition and announcement for couples during show by activities staff. Note: Please request your honeymoon package at time of booking (Three nights stay minimum required. Honeymoon couple must present proof of marriage at the resort). At Occidental at Xcaret Destination, you`ll be able to relax and enjoy two huge lake-shaped swimming pools with Jacuzzis, a gym, a solarium, two tennis and two paddle courts, archery, shuffleboard, mini-golf, and supervised kids activities. Many Guests opt to take an unforgettable tour to the ancient Mayan ruins of Tulum or Chichen Itza. Excursions to Tulum, Coba, Chichen Itza, etc. At the eco-archeological Xcaret Park just steps from the Occidental at Xcaret Destination you can explore Mayan ruins, swim with dolphins, snorkel through underground caves, and observe hundreds of butterflies, tropical birds, jaguars and deer. Enjoy an incredible experience you will remember for a lifetime! Travelers with a taste for eco-touring and adventure can enjoy exploring the remains of a Mayan village, snorkeling through ancient caves and underwater gardens, swimming with dolphins, or observing jaguars in their natural habitat, all only a short distance from the hotel property.